Post your 'Chassis & Suspension' FAQs, comments & questions regarding Ducati motorcycles here. Well, here I am now 4000 miles later on with the 1979 Ducati 900 Replica number 146 that a number of you helped with advice whilst I was rebuilding. I've run her in meticulosly, 500 mile oil changes (oil cheaper than bearings) and 2500 miles before I opened her up and poured petrol on the bonfire, OMG that's such fun. She's been to the Isle of Man twice, first time taught me I should have fitted a Sureflex Kit when I built her. Second time, Closed Roads Parade Lap, pulled like a train and huge smiles. To top it off she won the Concours D'Elegance at the Vintage Club Rally (over 200 bikes). I love her to bits. This question is seeking advice on head bearings and adjustment. In the last 100 miles or so I have noticed on occasion when taking my hands off the bars that she wags her head. A fellow owner friend mentioned that its not unknown for head bearings on a rebuild to tighten up. So shes on the ramp today and tomorrows job is once again one piece fairing off and oil change (plus the third failed front inlet rubber). When the fairings off I will lift the front end up on a scissor lift and let the bars flop side to side. Assuming the head bearings are out of adjustment - whats the best routine to follow for the novice (I'm not done this before). I'm guessing slacken the centre cap head on the top yoke to allow top yoke to move up and down freely on the steering head? Then adjust the slotted ring adjuster on the top of the steering head? Apologies for such basic questions, but although I built it and adjusted them correctly on build, its not something I've yet done in service so thought I would ask advice first. Like wot Vince said, Stuart - it's a feel thing. Or as the book says, "The fork should turn smoothly from side to side, without undue friction and without any play". Yes, hmmm ... That doesn't help me so much . Procedure is to loosen everything up, including the top yoke clamp bolts, and then carefully tighten up the ring nut. Go gentle - it shouldn't require very much at all. Basically the bars should swing easily from side to side under finger pressure, but not 'crash' over at the end. Also, feel for any notchiness (is that a word?). This indicates the bearing is being crushed and may even have started to brinell. The top nut doesn't need to be done up especially tight, btw. But don't forget to re-do the clamp bolts ... : 30-35 lb/ft for the 10mm, 20-25 lb/ft for the 8mm. Another thought: at 4,000 miles you should also begin to suspect the front tyre. Have a look at the tread wear. 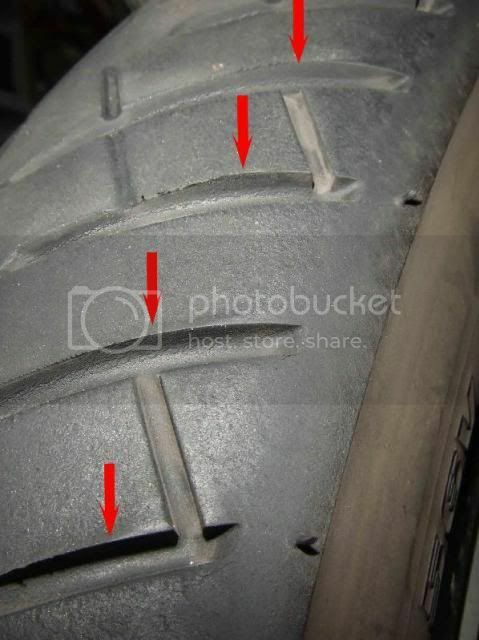 If it's beginning to look like this - the red arrows indicate areas of raised tread - there's your problem. DAMHIK. These were BT45s, btw. Short term solution is take some pressure out of the tyre - and meanwhile order up some new ones . FWIW it was once mentioned to me that a great deal of motorcycle front end issues begin at the back. While it`s up on the stand check the swing arm is correctly shimmed with no axial clearance and rear wheel bearings are in fine fettle. Thanks Vince. I'm pleased to report that when I came to check them, they are perfect and haven't shifted since I set it up. Appreciate your advice, thank you. Craig in France wrote: Like wot Vince said, Stuart - it's a feel thing. Or as the book says, "The fork should turn smoothly from side to side, without undue friction and without any play". Yes, hmmm ... That doesn't help me so much . Thanks Craig, great advice as ever and with all the detail needed too. Delighted to report that head bearings just right, as Id set them up. The tyres, you are on the money. My BT45 front looks identical to your photo. So I'll try a little lower pressure and fit a new front. Many thanks for that advice, as always, much appreciated. Lumpy wrote: FWIW it was once mentioned to me that a great deal of motorcycle front end issues begin at the back. While it`s up on the stand check the swing arm is correctly shimmed with no axial clearance and rear wheel bearings are in fine fettle. Thanks Lumpy. I did check rear end and went through the loosening swing arm pinch bolts and retightening. Bearings are fine, and side play fine. So rear end is sweet. Thanks for the advice. I think Craig may be on the money as my front tyre looks just like his photo. So that's the route I am going to go. Thank you for posting, appreciated.